Chandigarh , 08 Aug : solemn wreath laying ceremony was held today at Sandeep Shankla War Memorial, Sector 2, Panchkula, to pay tribute to the gallant officer, Late Maj Sandeep Shankla,AC of 18 DOGRA Regitment on his martyrdom day.Homage was also paid to Sep Swaran Singh, Kirti Chakra who also laid his life on this same day of year 1991 during the same operation. 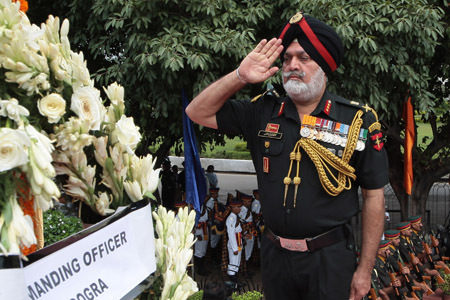 Lt Gen Jasbir Singh , Chief of Staff, Northern Command and Colonel of Dogra Regiment and Scout paid floral tribute to the Martyr on his 19th Martyrdom day. Maj Gen B K Chakravarty, Brig Sanjeev Narain and other serving officers of Western Command also paid tribute to the Martyrs. Veteran Army officers and civil dignitaries attended the solemn ceremony and paid Tributes. While speaking on the occasion Lt Gen Jasbir said it was most exemplary operation in the history of Indian Army where 9 terrorists were killed, 6 injured and 22 apprehended. Gen Singh later interacted with the parents of the Martyr and Ex Dogra officers who had close affiliation with Major Shankla. The contingent of 18 DOGRA Battalion, thereafter, presented a ceremonial guard of honour and a two minutes silence was observed as mark of respect to the martyrs. The buglers sounded the last post followed by the rouse. The well coordinated drill by highly spirited, well turned out Jawans of 18 DOGRA, embellished the scene. On this day in 1991, in a counter terrorist operation Maj Sandeep Shankla made his supreme sacrifice while leading a daring operation against the terrorists which resulted in elimination of nine terrorists and apprehension of 22 terrorists. For his dare devil action, most conspicuous courage, devotion to duty and valour Maj Sandeep Shankla of 18 DOGRA Battalion was awarded the highest peace time gallantry award The Ashoka Chakra, posthumously. Sep Swaran Singh was posthumously awarded Kirti Chakra (second highest gallantry award) and Capt BJS Sandhu was awarded Shaurya Chakra (Third highest gallantry award) for display of courage, valour and chivalry in the operation. In addition, 18 DOGRA Battalion earned Five Sena Medals, Two COAS Commendation Card and One GOC-in-C Commendation Card in the same operation against the terrorists. The memorial services and Wreath Laying Ceremony at the Sandeep Shankla War Memorial were a perfect tribute to the Martyrs who made the supreme sacrifice to uphold the sovereignty of the Country.